In the era of Internet, server monitoring shouldn’t be limited to Desktops only. Native Mobile support is growing now a days like an essential part of the technology and productivity tools. 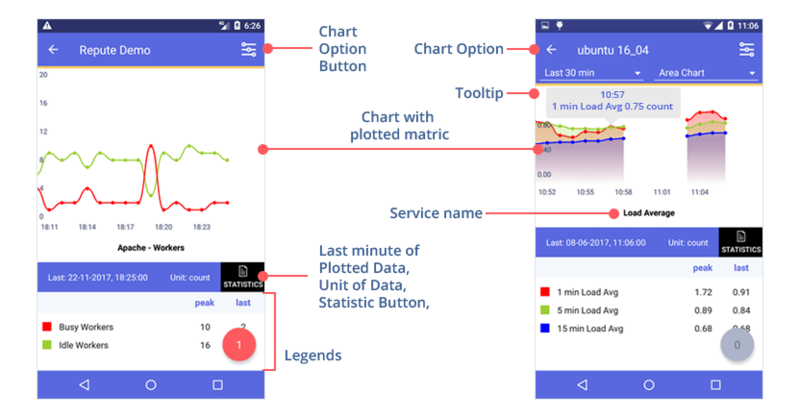 To stay up-to-date, Nodelizer extends its monitoring support with Native Mobile apps for Android and iPhone. 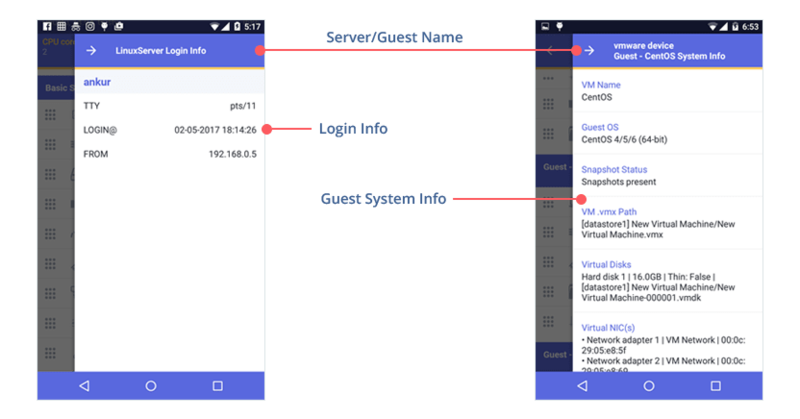 Nodelizer Native Mobile App allows you to remotely track status, health & availability of your system(s), anytime – anywhere; and you can make sure your server are up and available. Green / Red indicator for server’s up / down status. 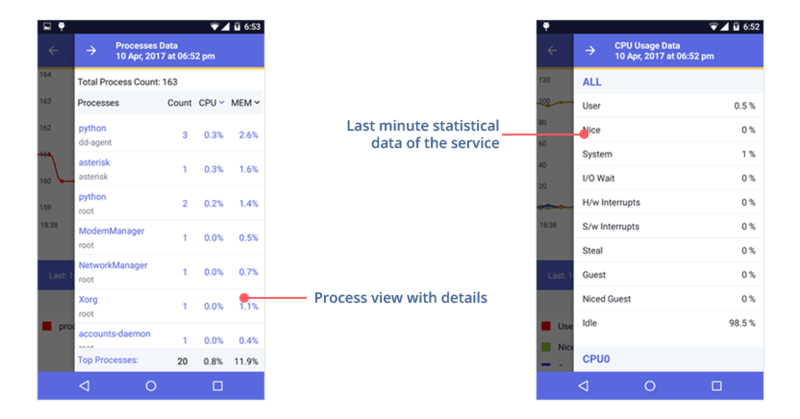 Open Alert count – when you tap that, a pop up will be opened having basic details and view button will lead you to the Graph screen for more details(with last minute entry of statistic for that service). Just drag & drop the server to make your prioritized server list. Server’s Name & System info on the top. At bottom right there is a FAB showing no. 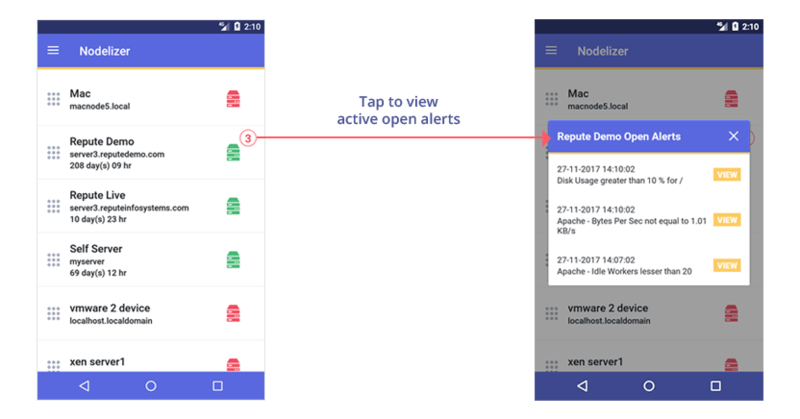 of open alerts count – which you need to focus to make your server available. Just tap on the FAB and view more details in the list of Active and Past alerts. A green / red status is available for the VMWare / XenServer guest whenever they are up / down. To view the list of active(if any) and Past(if any) alerts for that service specific. 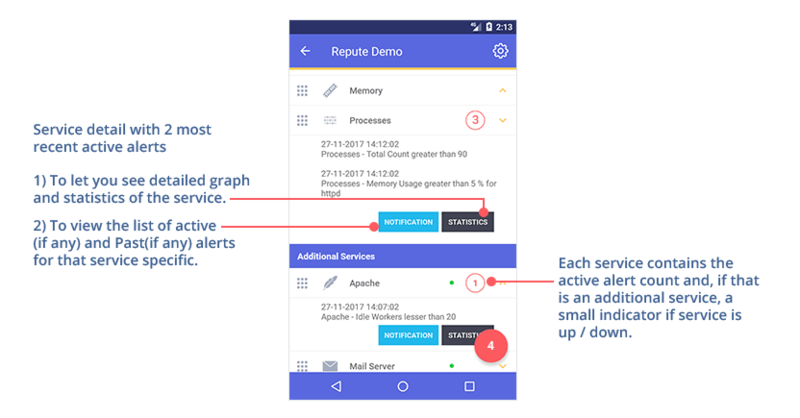 Each service contains the active alert count and, if that is an additional service, a small indicator if service is up / down. Just drag & drop the service to set your oder of your high prioritized services on top. With server’s, there can be such situation when you have such critical issue that needs your attention on some or group of applications. In such time or for short period of time, as per your convenience, Nodelizer Mobile App lets you to have customized experience of monitoring only those service which might be your top priority and hiding others. But you always can make them visible again whenever you need it. Top right corner contains Gear icon to let you show / hide service you wish to see in mobile app. Like load average , network traffic are hidden for the moment. If the server is linux, Mac, FreeBSD, then from the server’s home,there will be basic metric called – Login info. This will open right side quick view with login related information of the server. This will appear only when your server is up. for Guest there will be System Info contains details for each Guest’s Systems. Do you remembered the FAB showing active Alerts count in Server’s Home? When you tap on that it will show you the list of Active Open Alerts as well as the Past Closed Alerts if any. 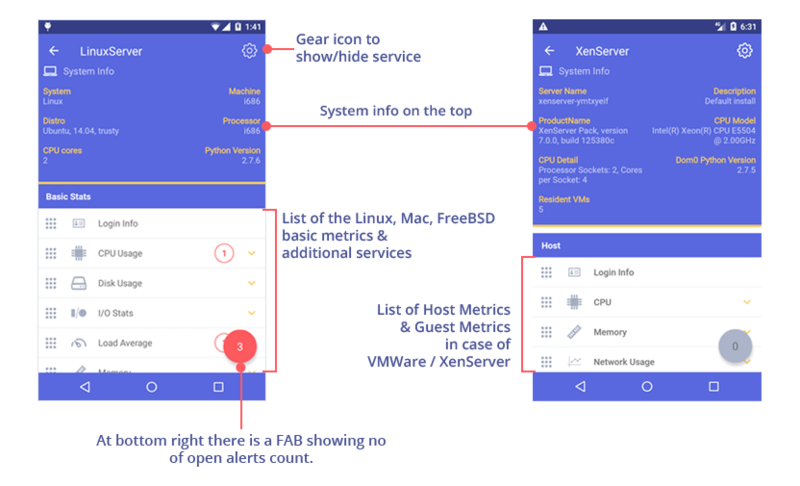 To view all active / past alerts of the individual service, just tap on the Notification button, visible in service’s basic details in Server’s Home. 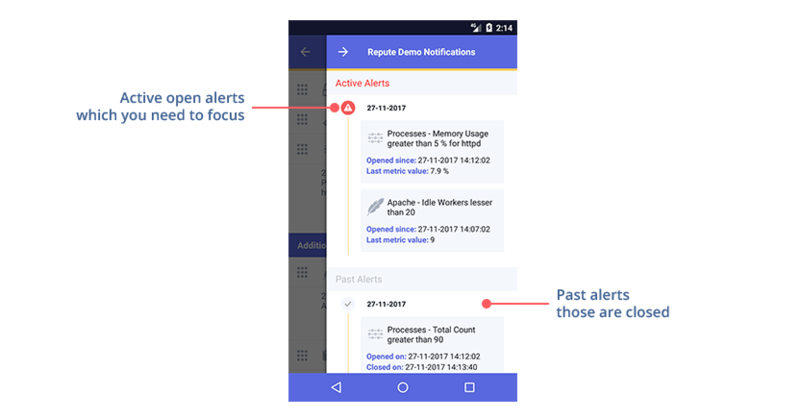 For active alerts you can see the time the alert is Opened since and the last metric value for that service if any. These alerts are pre sorted date wise so you won’t find difficulty to be update with latest alerts. And also it helps you to find old alerts if you remembered date. On the top there will be Server’s name or if the graph is of any Guest metric then Guest name will also be displayed. Next is Graph for the Service. If you tap on any plotted point of th metric, a tooltip with basic details of that metric will be show for that particular time. On top of the graph few options like time interval of the graph, Chart type, Graph specific drop-down for different metrics. These options can be visible / hide from the Chart option button in top right corner. Below the graph the blue belt will show the time duration and unit for the plotted metrics. Below the blue belt Legends will come with color for the plotted metrics with last and peak value from that time duration of the graph is shown for. You can also hide / visible the legends as per your preference. Bottom right again the FAB is appeared with showing the total no of Open Alerts. When you tap that, right side quick view will be opened to show detail of alerts. 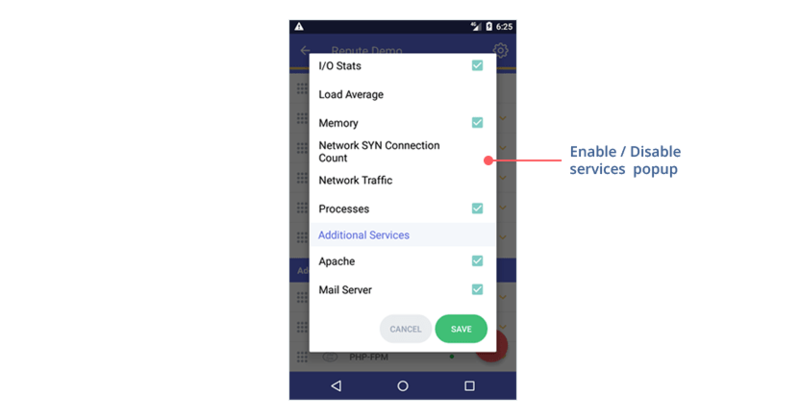 In the blue belt, there is a button called Statistics which will show the last minute values for all the metrics of that service specific in the right side quick view. If the service is process, then there will be list of top process with details containing process name, user, individual process count, mem , cpu. For other services, this quick view contains last minute entry for all metrics plotted in the current graph.